Super Blue Dream is fast-acting and known to create head high effects. It delivers a quick, powerful cerebral high, creativity, euphoria, and feelings that make the user more sociable. While it is quite powerful, it also enhances focus to help you get things effectively done. 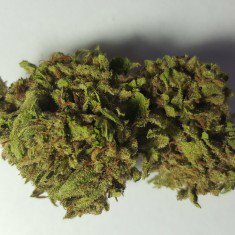 Super Blue Dream is a good choice for treating Chronic Pain, Nausea, Anxiety, and Depression. It is an excellent strain for those with attention deficit disorders. Patients who are susceptible to panic attacks or paranoia should however consumer Super Blue Dream with caution, as its sativa effects can become overwhelming when used in large doses. perfect for removing pain and good for the daytime, makes me happy!!! High quality strain. Potent stuff. Try it! great weed, and came right on time. thanks! Really good for long time relaxation!